When a girl asks her partner for some underwear for Christmas, most would have in mind a nice bra, some matching knickers, perhaps a negligee. Not for me however. 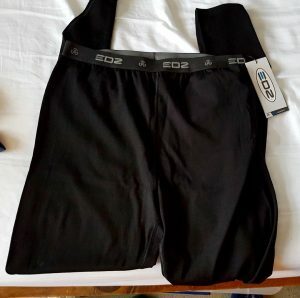 For Christmas I want some more EDZ merino base layers. 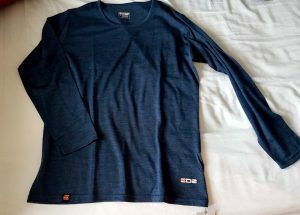 Last February at the Excel Bike Show I purchased a ladies merino long sleeved crew necked base layer made out of 100% merino wool with some 100% merino wool leggings. I have worn them pretty much constantly when out on my motorbike ever since. At the Bike Show, the EDZ stand was offering a small discount. These items do retail at quite a lot when compared with other base layers, especially those made from artificial fibres. Merino wool is a natural fabric which breathes really well and these base layers are made from a thin breathable wool which keeps the wearer cool in summer and warm in winter. It does seem odd to suggest wearing wool during the summer months, but it really works. It wicks away sweat and allows it to evaporate, so works well under leathers in hot and sweaty weather. In the winter time it traps warm air and insulates the body, without getting individual getting sweaty. EDZ claim that you can wear the base layers for up to 7 days without needing to wash them, due to the natural antibacterial property of wool. They are not only designed for motorcycling but for active outdoor pursuits such as hiking, bicycling and mountaineering. In the interests of ‘science’ I did test this claim in the summer when on a week long trip on my motorcycle. I wore my base layers every day for 5 days and did not wash them, most days riding at least 100 miles, mostly riding more. Every night I laid them out to air. By the end of 5 days they were getting a bit pungent, but nowhere near as bad as you might expect such garments to get! To care for the garments they should be washed on a gentle cycle at 30C. I would definitely recommend these layers all year round, including the neck tube, socks and inner gloves- please see my other review for these. They are expensive but they are so good and I wear them so often I definitely think they are worth it. I know what I’ll be asking Santa for this Christmas! Passed my test when still a teenager- not that long ago!